In 1973 John, Lane and Karl Giguiere moved back home from college to save the family farm and ended up creating the wine region of Yolo County. That's it in a nutshell, but it took a lot of work. They planted a 10-acre vineyard on land that had traditionally grown wheat. Nobody thought they would succeed, as grapes had never been planted there before. So much for conventional wisdom. By 1993, they had created the Dunnigan Hills American Viticultural Area, putting northern Yolo County on the map as a grape-growing region. They developed over 3,000 acres of grapes on the old family farm and became one of the most successful wineries in America. They sold the winery in 2000 and decided to retire to the beach in Northern California. That didn't last long. 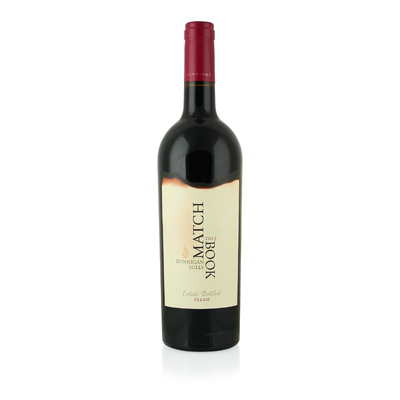 When a neighboring sheep ranch came on the market, they purchased it and founded Matchbook Wines. The name comes from the Giguiere brothers' fascination with starting fires as boys - until mom took the matches away. Well, here we are 1600 acres of grapes later, and they are still making some of the best wine values on the planet. Our selection is a perfect example. Here is textbook $25 Syrah at a fraction of the cost charged by the high-priced spreads. Lovely blueberry and earthy character almost invade the chocolate and black pepper flavors, but all find a warm place on the palate, enticing every taste bud. It's one of the best we've tried in a long time.